Defining physical characteristics: Well – she’s tiny. And pretty, with a broad smile (which her ‘aroos’ or daughters-in-law work hard to keep on her face). And she has a cracking figure for a lady of 70 odd. Often to be found: Practically always to be found in the kitchen, truth to tell. Although she is passionate about reading and pukka literature, and she does have a weakness for the soapiest of Persian soaps. Like most Middle Eastern ladies, she does like a bargain, and is thus very happy to browse Peckham’s plethora of Poundland/Ville/World shops. Potted CV: Afi was born in Kermanshah in the West of Iran, the second of seven siblings. She was a naughty child (and still has a feisty, rebellious streak), but she was as studious as she was beautiful and qualified as a Persian literature teacher. She also caught the eye of Cyrus, an engineer from a good family, and they married and moved to Tehran, where his business thrived. 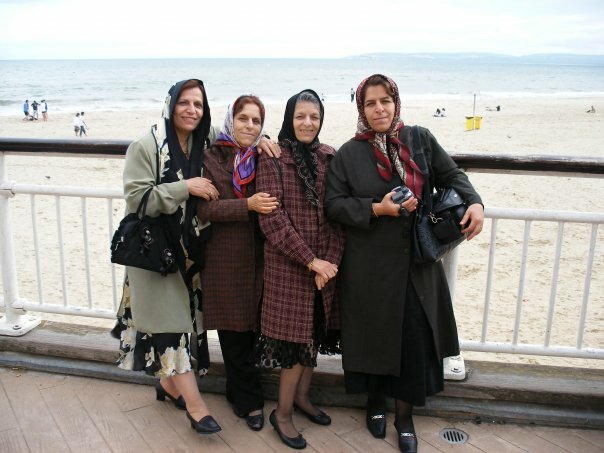 Life was very good to them until the Iran/Iraq war, when fear of the military draft forced them to move their four boys (starting with the eldest, Mr. Shopkeeper) to Europe. During the years which followed she endured endless hardships and insecurity in the name of giving her children a better future: she is made of some tough mettle. She is slightly terrifying, but at the same time one of the most generous and selfless people we know. Mrs.S. is honoured to be her daughter-in-law. In no particular order she loves: tea, Conan the Barbarian, khoresht-e-gojeh-sabz, cutesy little trinkets, high literature, the music of Sattar, cats and shoes. The melons are jolly heavy, and I would worry that they would get damaged in transit. You’ll just have to head down this way some time!